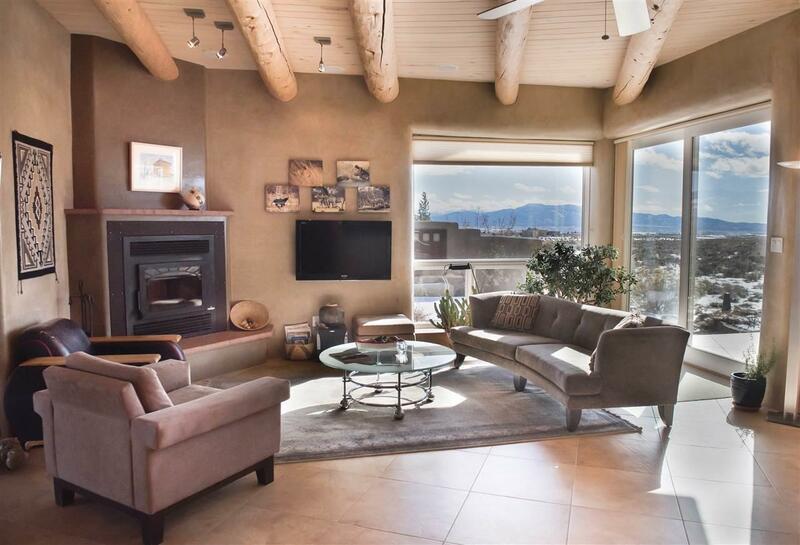 Perfectly situated and designed, this contemporary home and guest house located in the Vista Grande Subdivision, captures spectacular views in every direction. Designed by the owners and Karlis Viceps, Solar Plans LLC, this property seamlessly marries ecological, sustainable design with elegance and modern comfort. A custom gate welcomes one into the walled, landscaped courtyard with covered patio spaces shared by the main house and guest house. Upon entering the foyer of the main house, an open living, dining and kitchen area invite you in. 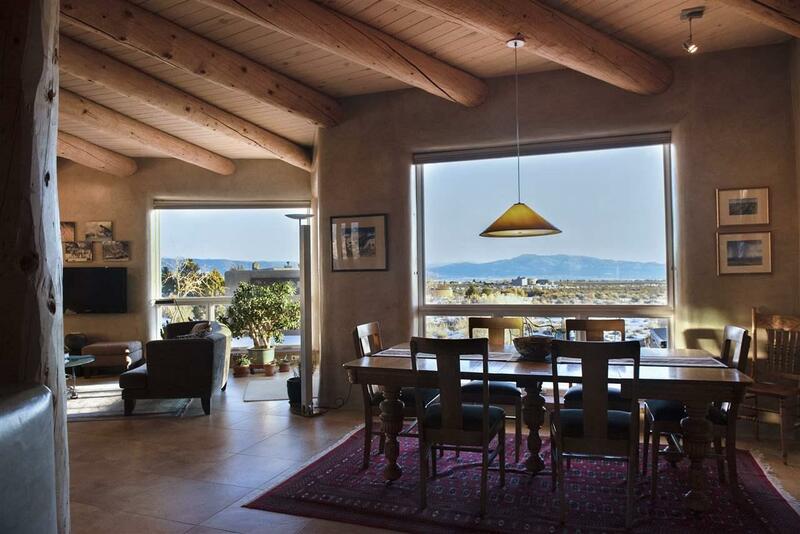 Large windows framing vistas and glass doors provide abundant natural light. 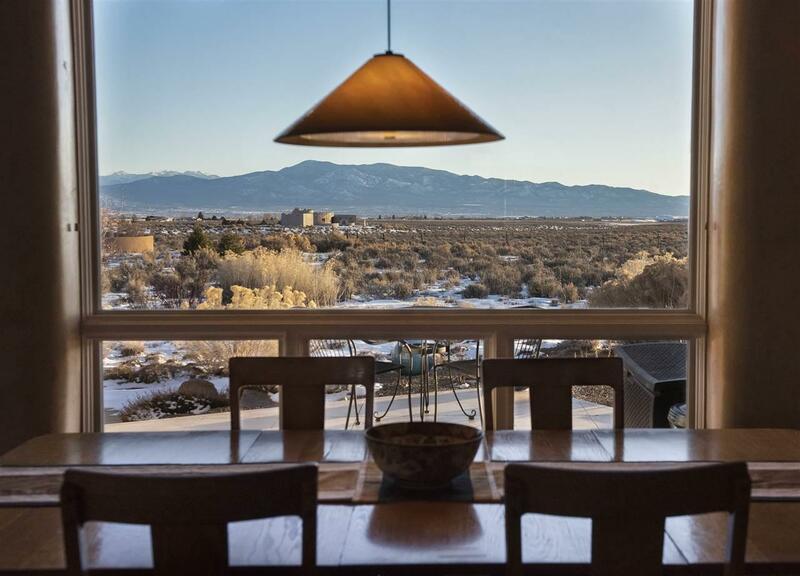 Quality finishes and architectural appointments throughout and views from every room. Beam ceilings and corbels, wood burning fireplace, rock window sills, concrete floors and smooth plaster walls create that welcoming ambience. Cook's kitchen with stainless steel appliances and granite countertops for entertaining with ease. Split floor plan with guest bedroom, office and bath to the East. Master bedroom and ensuite bath to the West provide privacy and quiet separation. Master bath features enclosed steam shower. Central vacuum plus a large utility room (with dog wash shower) and access to attached 640 square foot 2 car garage. 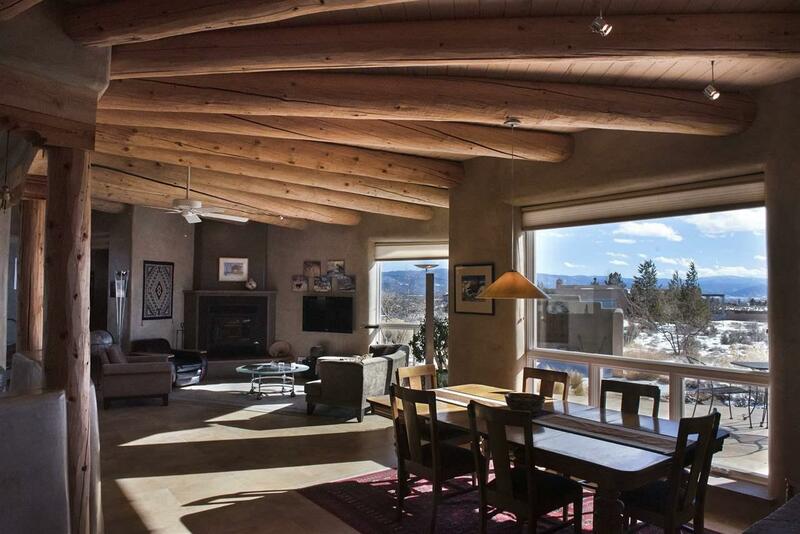 The 2424 square foot main house built in 2009 has 14 inch thick Pumice-Crete walls, 9 South facing Trombe walls, Breadbox solar water heater and solar tube lighting in Master closet and guest bath. The 672 square foot guest house built in 2005 has 12 inch thick walls made of Rastra and 3 South facing Trombe walls. An open living, dining and kitchen area featuring Richlite recycled, resin-infused paper countertops. Concrete floors, electric porcelain heaters and on-demand Rinnai water heater. This one bedroom and bath casita is a perfect space for family and guests to retreat. The main and guest houses exteriors have HardiePlank siding. This is made from natural and sustainable raw materials; it is durable and will not rot. Xeric landscaped gardens with extensive irrigation system using water catchment from 2500 gallon cistern fed from main house is on separate pressure tank. Property has Energy Star 5+ Qualified Residence 50% HERS rating = extremely low energy bills. This home was featured on the 2016 Home and Garden Tour and although we are having a great Winter; Spring will be the season when one can truly appreciate the beautiful and colorful palette of the outdoor gardens. Whether it is inside or out, the property is in perfect balance on 3.93 acres...a must see!